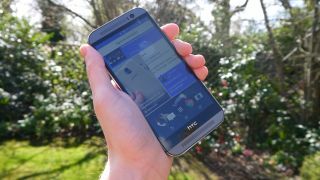 HTC's 2014 flagship might have been superseded by the HTC One M9, but it's still a brilliant handset with a stylish design and plenty of power. Being a year old it's also more affordable than the M9, but if you want to save even more money you might want to consider the newly announced HTC One M8S, which is a cut-price version of the HTC One M8. Of course you don't cut the price without cutting the specs and that's exactly what's happened here, so we've put the two phones head to head to see just how much has changed. The HTC One M8 and One M8S are packing identical screens, so whichever phone you pick you'll get to enjoy a big, sharp and impressive 5.0-inch 1080 x 1920 display with a pixel density of 441 pixels per inch. For what it's worth that's also the same as the HTC One M9, so you're really not sacrificing anything here, though some brands have moved their flagships on to QHD displays. There's almost nothing to choose in the design of the two phones either, and that's a huge win for the midrange HTC One M8S, as both handsets have a sumptuous metal shell that curves comfortably into your palm and looks almost unbeatably premium. There are some small differences in the dimensions though, with the HTC One M8S coming in at a marginally fatter 9.55mm thick, compared to the M8's 9.4mm thick body. That hasn't translated to a difference in weight though, with both phones tipping the scales at 160g. This is where the two phones really start to differ, as while the HTC One M8 has a 2.3GHz quad-core Snapdragon 801 processor the HTC One M8S has a 1.7GHz octa-core Snapdragon 615 processor, which despite the larger number of cores is likely to lead to inferior performance as it's a midrange chip. The two phones both have 2GB of RAM though, as well as both running Android 5.0 Lollipop, so while the One M8S might not be quite as high end it shouldn't feel lacking in power. The two phones cameras also differ. The HTC One M8 has a 4 UltraPixel duo camera on the back and a 5MP snapper round the front. The HTC One M8S also has a 5MP front-facing camera and its rear camera is a duo one as well, but it's a 13MP one. In practice that's likely to mean you'll get sharper images from it, but it almost certainly won't fare as well in low light. Whether it's an upgrade or a downgrade is debatable, it's more just different.